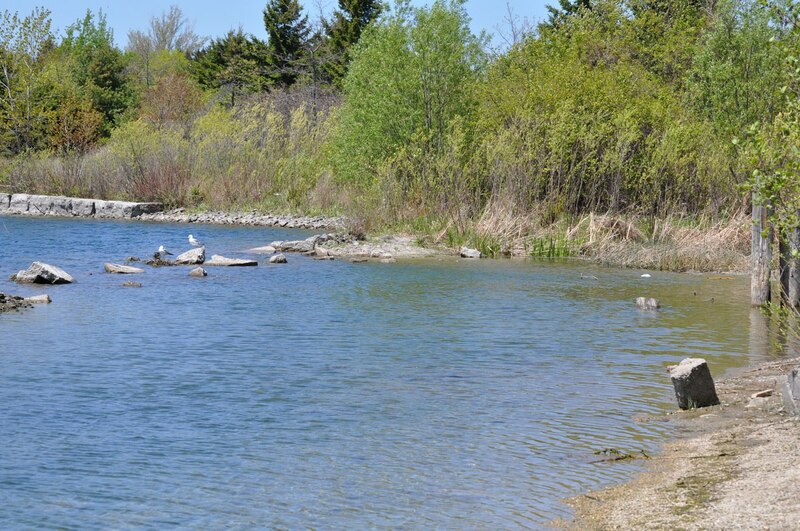 On one of our spring birdwatching excursions, Bob and I dropped by Colonel Samuel Smith Park in Etobicoke. The favorable habitat of this urban park attracts many species of migrating warblers, and it often rewards us with sightings of shorebirds. 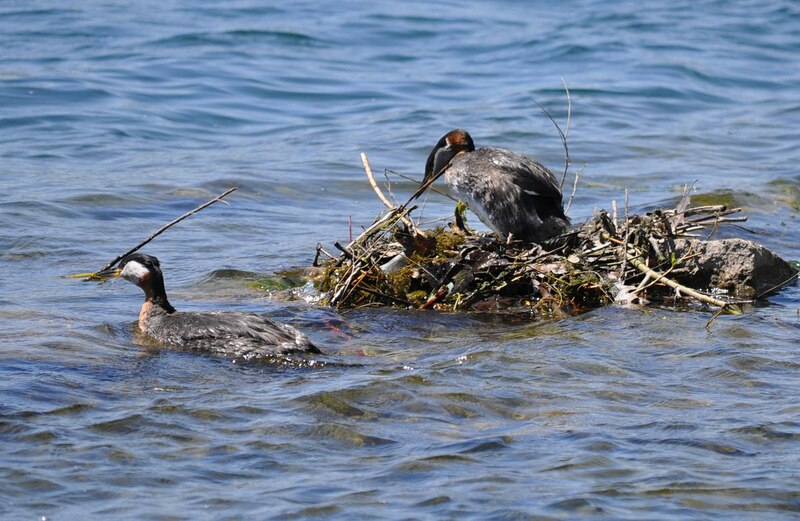 On this particular day, it was a nesting pair of Red-necked Grebes (Podiceps grisegena) that stole our hearts. 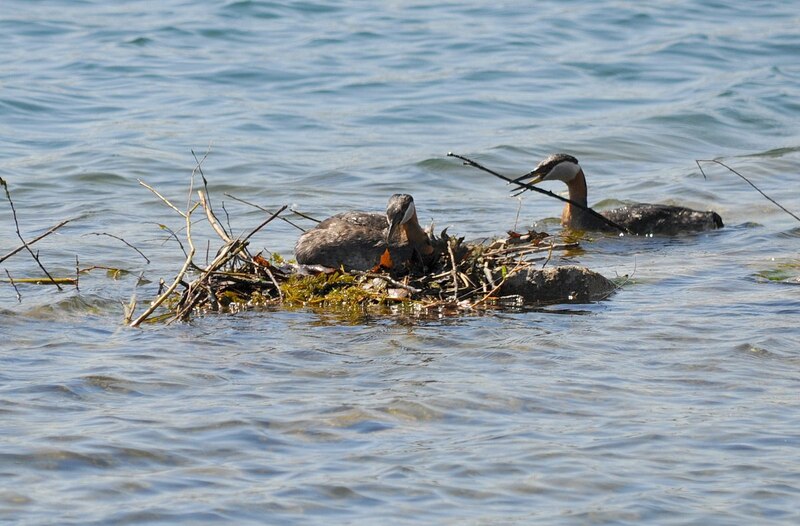 As Bob and I strolled out along Whimbrel Point, we discovered that there were no less than three nests occupied by Red-necked Grebes, these being constructed on appropriately-placed artificial platforms. Red-necked Grebes breed in isolated pairs, and require at least 50 metres (160 ft) between nests, so the TRCA ( Toronto Region Conservation Authority) has placed floating platforms that are anchored in place to provide a base for a number of nesting Grebes. The nest that was most visible from our vantage point appeared to be buoyed by some huge chunks of concrete that had been placed fairly close to shore. The female Grebe was stationed on the mound when first we spotted her, and the male was circling the assemblage of twigs and other vegetable matter, keeping a close check on his mate. 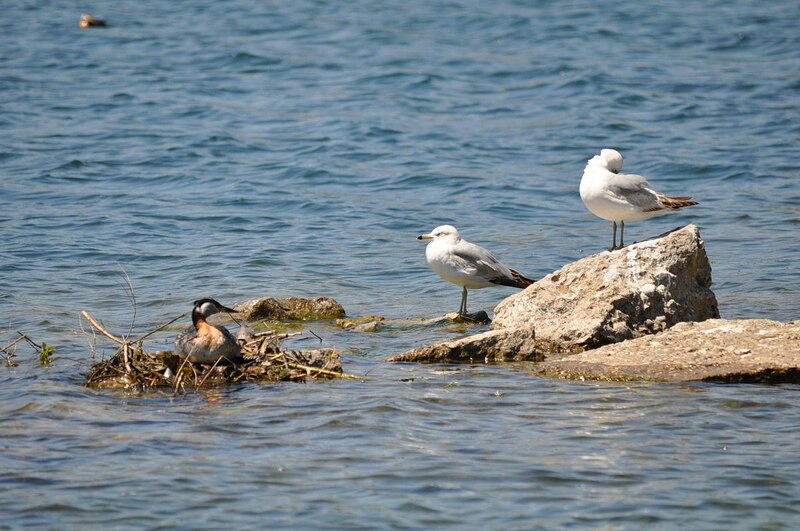 The proximity of a pair of Ring-billed Gulls seemed to be the reason for the Grebes’ concern, and we soon discovered why. They were keen to optimize any opportunity to raid the Red-necked Grebes’ nest of the one egg that we could see resting there. The female Grebe was not content with the position of the egg and proceeded to rotate it in its bed of rotting aquatic vegetation. 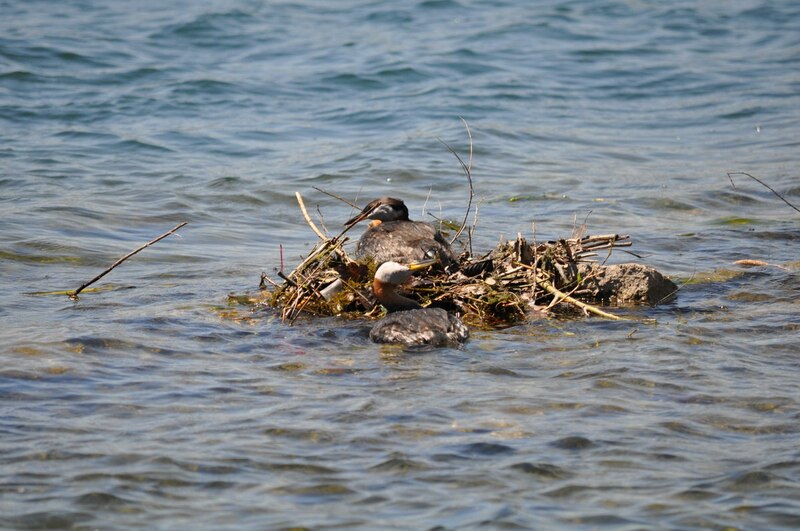 Because a Grebe’s nest has a depression in the centre of it, and the bulk of the nest is situated below the water line, it is not uncommon for the eggs to get wet even though the nest is most often close to shore where it is protected from wind and waves. 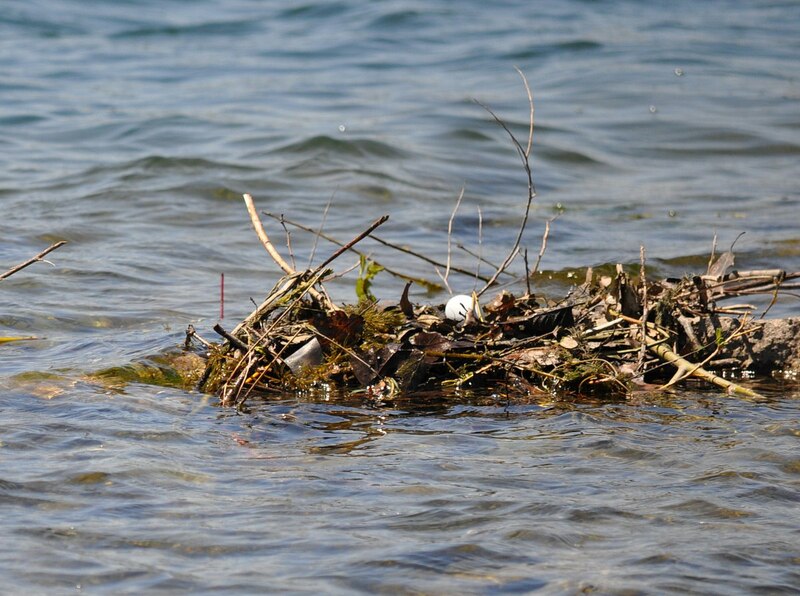 To prevent the nest floating away, it would be cleverly tethered to either underwater vegetation or a sunken log but in this case the concrete blocks serve as the anchor. Red-necked Grebes seldom leave the water because they are quite clumsy birds on land owing to the placement of their legs towards the rear of their bodies. This, together with the fact that they have small wings, means that these Grebes are unable to take flight from land and are unable to move quickly when on solid ground. Even on water, Red-necked Grebes require a lengthy run in order to gain sufficient speed before taking flight. That is why Grebes seldom fly except for the purposes of migration. After carefully manipulating the egg in the nest, the female stood tall, flapped her wings and put on quite a show of shaking her body before settling back on the egg. Red-necked Grebes lay their eggs between the middle of May into June in North America, and generally four or five bluish-white or pale buff eggs are laid by each female. Bob and I continued out along the peninsula, and when we stopped by the Grebes’ nest on our return towards the parking lot, we were horrified to see the egg untended. We later learned that it is normal for both parents to vacate the nest for significant periods of time, but that is typically during the night. What were they thinking with the ravenous Gulls waiting to pounce? 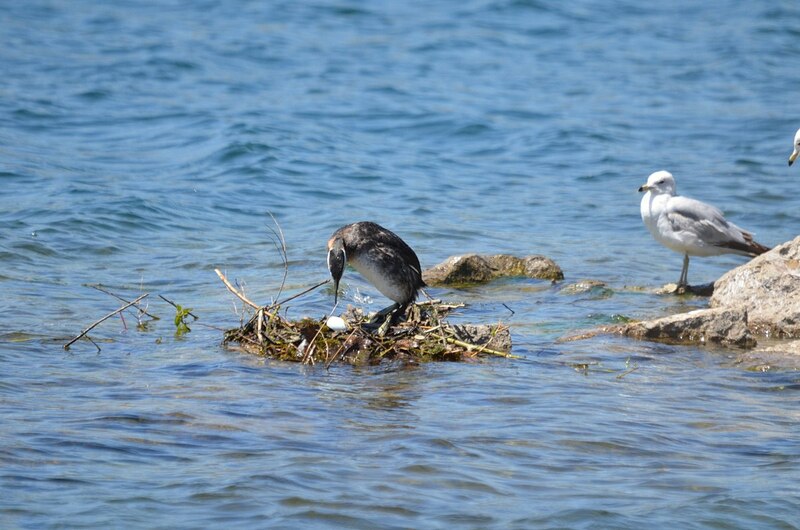 It turns out that the pair of Grebes were actively engaged in procuring more materials to add to the nest, during which time, both were keeping a close eye on the egg. The adult Grebes would take turns diving, and would swiftly bob back to the surface with a twig clasped in their bills. 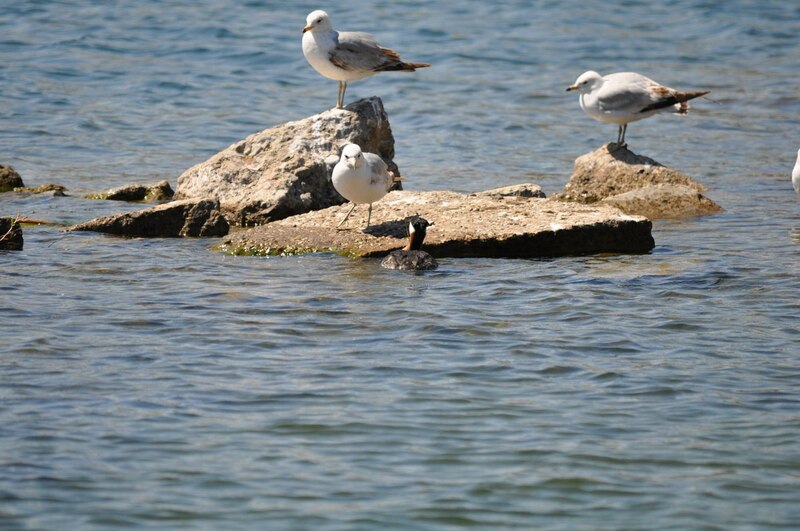 One Grebe seemed to dare the Gulls to make a move. 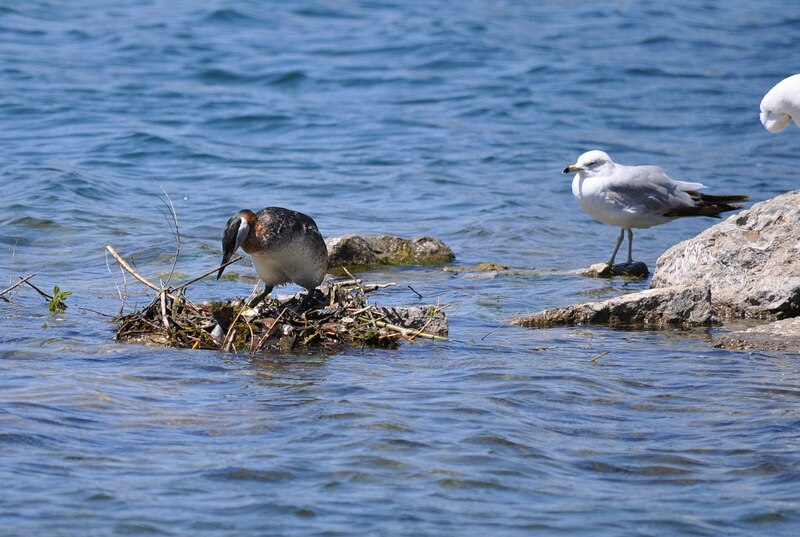 After a considerable length of time, and dozens of pieces of vegetation being nimbly placed on the growing pile of nesting materials, the female Grebe returned to the nest and delicately began to adjust the positioning of numerous sticks. The hen then settled down, but her mate continued to retrieve bits of vegetation and lovingly placed these next to the hen or hand them off to her, beak to beak. We were just relieved to have the egg under cover once again. 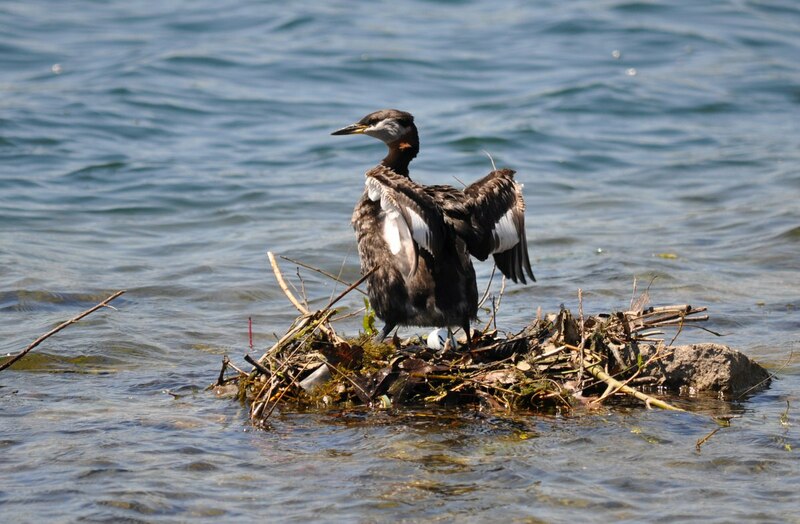 This is the third year in a row that Red-necked Grebes have successfully nested in Toronto, which is the most easterly known nesting location of this prairie-nesting species. We are very lucky! the mother reminds me of a penguin standing there over the egg. The more I read, the more fascinated I become by birds I didn’t even know existed close to me. That is why we tell people that they do not have to travel to far off exotic locations. Nature has plenty to offer right in our own backyard. All it takes is a trained eye to begin seeing more of what is around us.